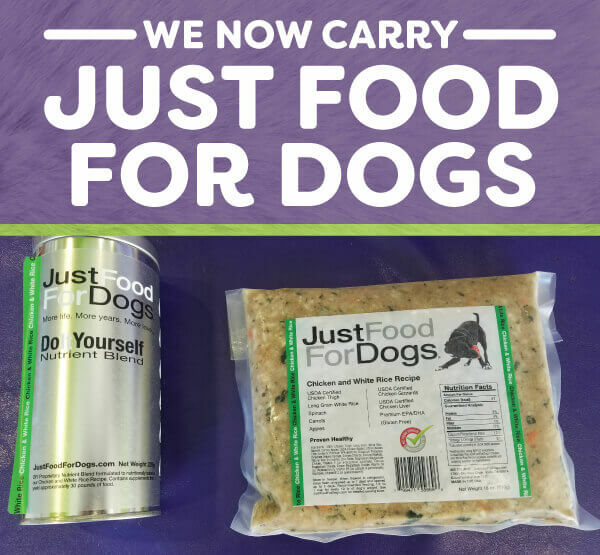 We Now Carry Just Food for Dogs! We have been recommending Just Food For Dogs (JFFD) for many of our patients for the past several years. At OC Veterinary Medical Center, we have been very impressed with the quality of their food as well as their level of customer service. Our patients on these diets have done very well. We are now proud to carry JFFD in our hospital which eliminates the need to go to Costa Mesa’s JFFD kitchen. JFFD was founded in 2010. They are a whole food company, meaning they use the same ingredients you use to make your own food at home and have no preservatives. Their diets are cooked, which makes them much safer than raw or freeze-dried foods. Their diets are also all formulated by veterinary nutritionists, and every location where the food is made has a veterinarian trained by their nutritionists. Their kitchens are transparent, meaning pet owners can watch their pet’s diet being made if desired. All of their diets are formulated with AAFCO standards including animal feeding trials, which is the only way to ensure that their diets are safe and nutritious for pets (the only exceptions are diets formulated for specific pets). They also use USDA-approved human standard ingredients (restaurant quality). When a problem occurred with one of their ingredients, they immediately notified all pet owners as well as veterinarians regarding the issue (which we appreciate as many companies don’t notify veterinarians right away). The diets are purchased frozen and require thawing in the refrigerator. They have a variety of diets available for owners who want a better, high-quality whole food diet, for pets that are just fussy eaters, for animals requiring specific diets for medical problems or for individualized diets. Besides the premade diets, JFFD also has a line of supplements. Their nutritionists can also custom-formulate recipes for pet owners to cook at home, providing all the necessary supplementation to add to ingredients purchased in a grocery store (do-it-yourself meal kit). They have developed hundreds of custom recipes for medical conditions which include: cancer, obesity, food allergies, metabolic diseases, kidney disease, liver disease, bladder/kidney stones, and other conditions. They also offer snacks as well. While our office does not make the diets, they are delivered weekly (and even next day if an emergency arises requiring immediate delivery). We offer many of their diets which include diets for general health as well as specific medical conditions. They also have a smaller line for our feline friends—Just Food For Cats. If you are interested in their diets, you can go to their website: justfoodfordogs.com. You can also consult with our veterinarians to make sure to get the right food for your pet’s needs. We can always help you order the right food, too! This partnership with Just Food For Dogs will help to make sure your best friend is on the highest quality diet. Please let us know if you have any questions.